Sir Lucian Grainge’s Universal Music Group dominated the blockbuster record industry in the first half of 2018. UMG-affiliated acts claimed eight of the Top 10 artists in the States in the opening six months of the year, according to Nielsen – including the full Top 5 (Post Malone; Drake; Migos; XXXTentacion; J.Cole). Grainge famously banned streaming exclusive deals across UMG’s labels in 2016 – a democratic approach which the British exec clearly believes has subsequently played into the hands of his company and its artists. Speaking during his opening address this morning, Grainge also appeared to nod towards the recent news that UMG parent Vivendi is seeking a strategic partner (or two) to buy a minority stake in Universal. And, just as he did this time last year, Grainge couldn’t resist jabbing those who reacted negatively when, in 2011, UMG agreed to pay $1.9bn to acquire EMI Music – a buyout which included Capitol Music Group and its Hollywood icon of an HQ, the Capitol Tower. Soon after buying EMI, Grainge appointed his fellow Brit, Steve Barnett, as CEO & Chairman of Capitol Music Group. Barnett has steered the ship of CMG ever since, making major moves such as enabling the revitalization of the Motown label as a modern day hip hip-force, and striking a deal with the home of Migos, Quality Control. Barnett introduced Grainge at Capitol Congress today, while praising a raft of the company’s internal players. He made special mention of the fact that CMG’s indie artist/label services arm, Caroline, has doubled its US market share over the past year. “Those of us who were there [buying EMI] in 2011 will never forget what the naysayers were saying,” commented Grainge. “That’s okay – being a contrarian and betting against the odds is second hand for all old talent scouts. 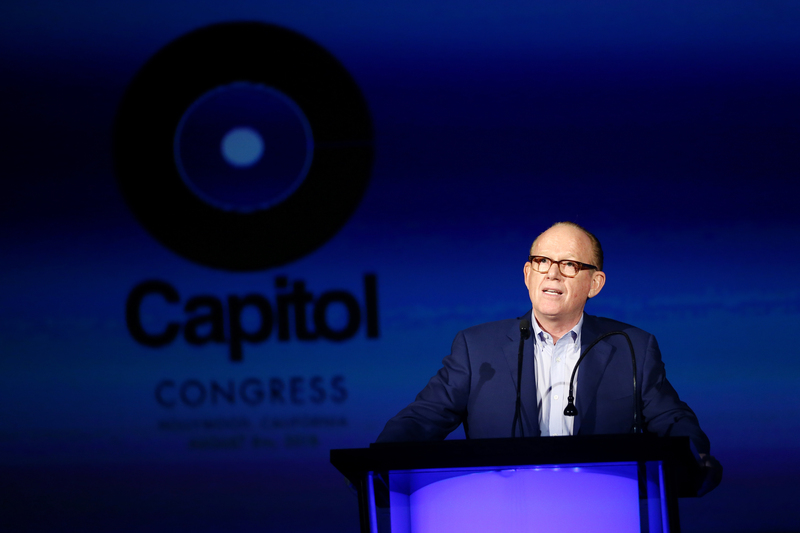 Speaking before Grainge took the stage, Barnett revealed that Capitol has been working with Berry Gordy on a new Motown documentary ahead of next year’s 60th anniversary of the legendary Detroit label. Hitsville: The Making Of Motown has been co-created with Fullwell 73, the production company behind The Late Late Show with James Corden (and its hugely successful artist-led feature, Carpool Karaoke). Barnett said that one particular quote from the movie – Gordy explaining that Motown had to “innovate or [we] would stagnate” – chimed with his own team’s philosophy at CMG. One of the boldest changes at Capitol over the past year, explained Barnett, was the implementation of a single global marketing team across all disciplines. “Most [music] companies in the world operate with a domestic marketing team, an international team and a digital team,” said Barnett, adding: “We had to [make that change] because we live in a global world. In addition to praising his current team, Barnett led a special tribute to the former Chairman & CEO of Capitol Christian Music Group (CCMG), Bill Hearn, who sadly died last year. Barnett called Hearn “a special and unique guy”, commenting that “he was one of the best operators I’ve ever worked with, as well as an incredible human being”. Barnett noted that someone at CMG had recently pointed out to him that more than half of the company’s senior executive team is now comprised of women – including CMG COO Michelle Jubelirer, Motown President Ethiopia Habtemariam and Caroline GM Jacqueline Saturn. “That’s something we’re very proud of, and [gender parity] should be the norm in our industry,” said Barnett, to widespread applause.